Finding a cab, especially during peak travel times or in less-traveled areas, can be an incredibly frustrating task. But car services are often much more expensive than the average cab ride. Enter UberCab, a new service that offers an on-demand car service via an iPhone app or SMS. After signing up for an UberCab account and downloading the free iPhone app, you can then set your location and request a car service from the application. The app will determine your location and you can set your exact pickup location. 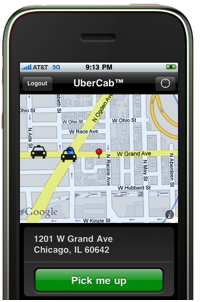 UberCab will then send your request to their network of drivers who happen to be in the area. The driver will accept your request and you can then input your end location. The driver will alert you when arriving, and once you entire the car, you hit begin trip on your app to begin your fare. The driver also has a connecting app, which he will use to input the end of the trip. At the end of the trip, your pre-set credit card that you input when you set up your account will be charged and you won’t have to dole out any cash. UberCab calculates the cost of your trip based on milage and time in the car, similar to the way other limo companies calculate fares. However, the startup says you are able to get better fares because its drivers perceive these on-demand trips as extra money in addition to their regular full-priced trips to and from the airport. Interestingly, UberCab asks that both passengers and drivers rate each other, Yelp-style. This helps UberCab ensure that passengers and driver are using the system properly. Unfortunately, UberCab is only available in San Francisco (although UberCab’s site says it will also be beta tested in Chicago). That being said, if UberCab were in the city that I live in, I’d probably use it. I’d definitely be willing to pay a little extra to ride in a nice car with the convenience of door to door service. And initial reviews from local San Francisco users on Twitter seem fairly positive. UberCab as a technology will compete with Cabulous, which displays cabs in your area, tracking them in real time, and TaxiMagic. UberCab Demo from UberCab on Vimeo.